A new road project linking Queensland and New South Wales has reduced traffic congestion and slashed travel times for interstate travellers. The Tugun Bypass is a seven kilometre road link between Currumbin on the Gold Coast and Tweed Heads in northern NSW. "Finally, the long-suffering motorists of the southern Gold Coast will get some permanent relief from the congestion and traffic snarls that had become an all-too-common feature of the Gold Coast Highway along the Tugun stretch," Main Roads Minister Warren Pitt said at the time of the bypass opening in June. PacificLink Alliance, comprising Queensland Main Roads, Abigroup Contractors Pty Ltd and SMEC Australia Pty Ltd was appointed to design and construct the bypass. Work began in mid-2006 and culminated with the opening of the bypass on 3 June, 2008, six months ahead of schedule. 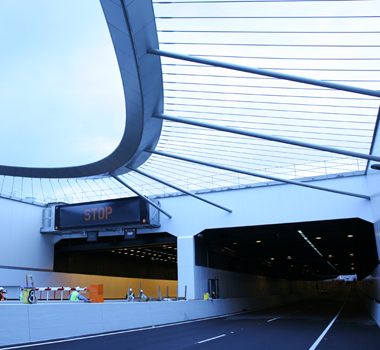 A 334-metre tunnel underneath the Gold Coast Airport's runway extension is the centrepiece of the bypass. Making sure that the tunnel is adequately ventilated, 18 Banana Jet fans have been supplied through Fantech. “We represent Witt & Sohn of Pinneburg Germany who are the world leaders in this type of fan,” Fantech Sales Engineer Lance Reeve said. “Our role was to supply Pacific Alliance with technical advice, installation procedures and final commissioning. “The Banana Jet fans have an impeller diameter of 1,250 millimetres and a 50 kilowatt motor. They were selected over the traditional jet fan because they are able to achieve a significant increase in air velocity with the same nominal thrust and motor power,” he said. Mr Reeve said the unique design of the Banana Jet improved the flow and the air velocity profile in the tunnel. It distributes the flow more uniformly by focusing the impulse towards the middle of the tunnel and reduces the losses in critical friction areas. He said investment costs were reduced with fewer fans required and subsequently reduced installation and cabling costs. This has flow on effects with less maintenance and lower overall power consumption. Queensland Premier Anna Bligh said at the opening of the Tugun Bypass that the new road was designed to take account of future growth. “The bypass is expected to carry between 35,000 and 40,000 vehicles per day, but has the capacity to carry the expected increase of 60,000 vehicles per day by 2017,” she said.